No carbs after dark! Eating at night causes weight gain! Nighttime eating will sabotage your goals! Thankfully, these thoughts are quickly becoming a memory of the past. Going long periods of time without eating can create a catabolic environment in your body, a phenomenon any serious lifter wants to avoid. Over the course of the night, you’ll fast for an average of about seven hours. Support anabolism during this extended time by eating a well-balanced meal before this fast begins, and leave these old notions behind for good. When it comes to your final meal of the day, your primary food selection should consist primarily of slow-digesting protein to keep your muscles fed during your long slumber. Possibly one of the most important factors to consider when deciding what to eat at night is when you train. If your sessions fall in the evening and your post-workout meal winds up being the last meal of the day, it should be structured to promote recovery and growth with carbs. However, if you hit the gym mid-morning or even in the afternoon or early evening, you can likely skip the carbs before bed and keep them portioned around your training session, where they’re more advantageous. Here are four great snack choices to fuel your body overnight with minimal carbs. 1. Casein protein. This option tops our list for two reasons: because it’s slowly digested by your body and it’s easy to prepare. Casein forms a gel-like structure when it hits the stomach, which takes the body longer to break down and release the muscle-sparing properties you’re looking for. This slower process sees a peak in amino acids and protein synthesis in about three to four hours, much longer than whey’s 30 to 60 minutes. This works to protect against muscle breakdown, something any serious lifter wants to achieve on a daily basis. Simply add a little bit of water and make your casein into a pudding, or add more water and drink it before bed—it doesn’t get much easier than that! Just watch out for adding extra sugar. 2. Cottage cheese. 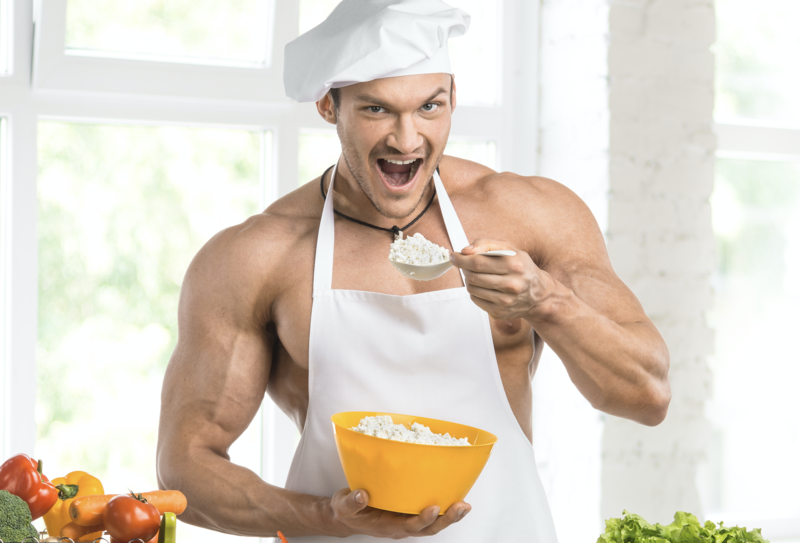 Cottage cheese includes casein proteins and is therefore is a slow-digesting food source. Although many people may have a hard time eating cottage cheese because of its texture, it makes a great base for a blended smoothie. To further extend its digestive time, try adding a serving of raw almonds for healthy fats and some crunch. 3. Greek yogurt “ice cream.” Greek yogurt has similar properties as cottage cheese but with a smooth texture. Mix a touch of casein protein with a serving of yogurt for flavour and pop it in the freezer for 10 to 15 minutes and you have a snack similar to everyone’s favourite dessert. Added bonus if your macros allow: Top with a drizzle of natural nut butter. You can thank us later! 4. Egg white omelette. Whipping up an omelette provides your body with a solid dose of protein and a variety of great micronutrients. Broccoli, leafy greens, cremini mushrooms, and bell peppers provide a host of micronutrients that are known to enhance sleep. Their fibre content will slow digestion, but don’t hesitate to add a whole egg for fat to further extend it. And if the perfect omelette eludes you and it becomes an egg and veggies scramble, don’t stress—you’re still reaping the same benefits. Don’t fear nighttime eating! Your meal selection should be tailored to your current daily macro balance, how your body processes certain foods, as well as how foods affect your sleep at night. There’s no benefit to eating a meal that causes indigestion and keeps you up all night. At the end of the day (literally), feed your body with healthy nutrients as suited to your goal. Get more great content each month by signing up for the free Muscle Insider Newsletter. Just click here.